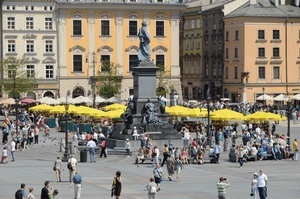 Everything worth seeing is included in this tour of Poland Treasures that takes you through most of the country and introduces to Poland's rich history and culture. Today you will be introduced to the highlights of Warsaw. Our morning sightseeing includes a visit to Old Town and its impressive Royal Castle, the seat of the kings of Poland. Old Town was beautifully restored after World War II. On May 3rd In 1791 the Constitution was proclaimed at this castle, making it the 2nd oldest constitution in the world, after the US Constitution. We will visit the Canaletto Room with 23 of his paintings, the Magnificent Knight’s Hall housing six large paintings by Marcello Bacciarelli, the Throne Room and the Marble Room which has 22 portraits of Polish kings, and the most impressive of all the chambers in the castle, the Ballroom. Lunch is served at a local restaurant in Old Town before we continue our drive past the National Opera House and Town Hall to the former Warsaw Ghetto. Later, we will visit the famous Wedel chocolate factory for a taste of their delicious hot chocolate at the “Wedel Old Fashioned Shop”.